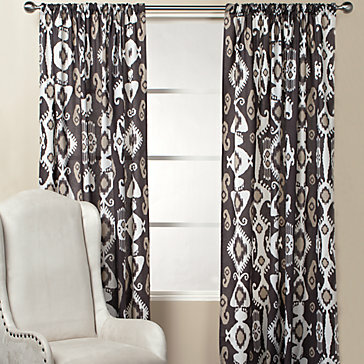 I was browsing Z Gallerie's site this morning and found these. Is there something wrong with buying curtain panels at 5:30 am, ones you've never seen in person, ones you don't know if you'll even like when they arrive, ones that you have no clue where you are going to put? Why you ask? Because they are $9 a panel! Darn sales get me every time! I bought 4, and I bought the longest ones so I can hem them and make pillows with the leftover fabric. Can you say shopaholic thrifty? Thanks for all the tips on the lanterns. I was at Pottery Barn yesterday and found this, might work. I'm sure glad I have readers who are willing to share their tips and tricks with me! Thanks for all the comments and emails! They are beautiful and almost for nothing. I enjoy your blog because you show such beautiful things. Have you ever visited Seattle Lighting? They have books and books of fabulous illumination and an awesome clearance section! I also wanted to tell you that Harley absolutely the most beautiful Lab! What a joy to come home to. We are greated by the Chocolate Gousse. She filled our empty nest! I just love great deals like that!! What a great buy! I love that:) Glad I found your blog, I just followed you and now I'm off to see your etsy. Love those curtains! Bought some for myself and my mom before they sold out. Thanks for the heads up on a good deal. head over to just beachy's blog...she just electrified some lanterns for her new home and they look great!